Well, not a complete fail. I mean, I finished (and barely- I didn’t plan ahead to have enough slack to cast off and had to trim the slack from when I started and tied it to my finishing end…) but that’s about where my knitting success ends. I’ll leave it to the picture to show where all the fail comes in. It’s a weird beaver-tail shaped paddle of a short, fat swiss cheese scarf. If look at one end vs the other, you can visually see my skill improve. It’s almost like those old pictures of the spider web after they gave the spider drugs. 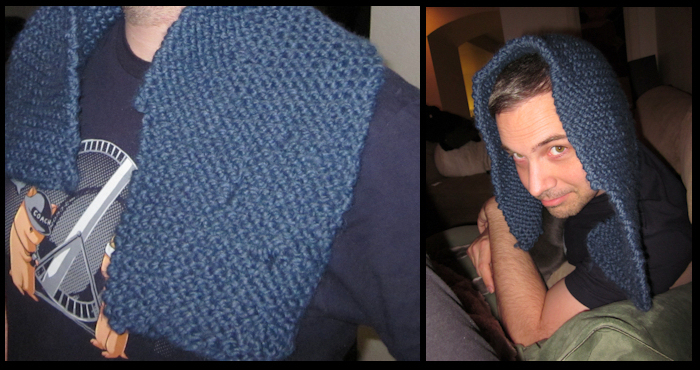 Hopefully next scarf will look significantly less retarded and MF will be happier to model it. learn! Excellent job! Martha ain’t got nothin’ on ya’! xo!